The new animated children’s movie Minions, a spinoff of the Despicable Me series, is the cinematic equivalent of a large bowl of Trix cereal: a colorful and sugar-filled offering that may have kids bouncing off the walls with excitement but will likely leave parents hungry for something more substantial. The antics of the small, yellow pill-shaped creatures work well in the confines of the previous films but when amplified to feature level, their charm begins to diminish considerably during the 90 minute runtime. It’s cute but seldom clever; innocuous but also not worthwhile enough to justify its existence. The film’s high note comes during the opening montage, in which chipper voiceover narration introduces us to the Minions as creatures who have roamed the planet since the dawn of time in an attempt to serve the most maniacal evildoer that they can find. 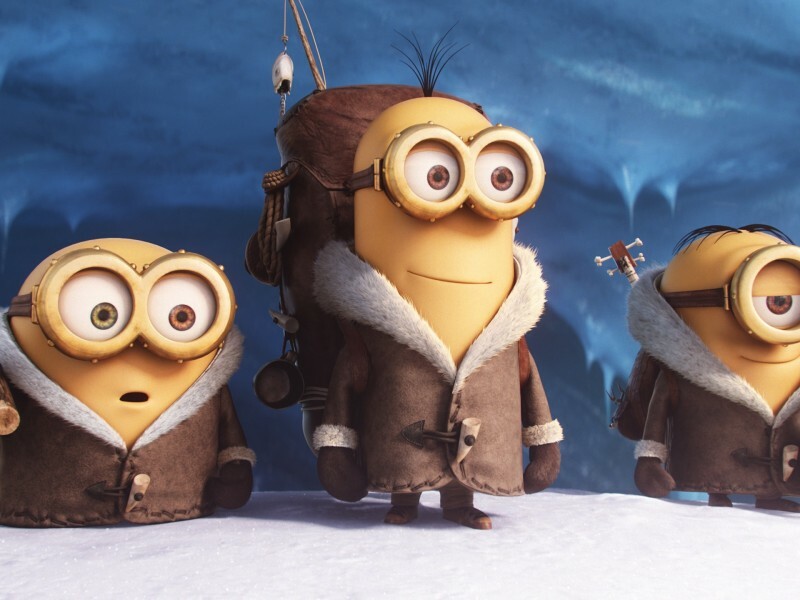 After candidates like the Tyrannosaurus Rex and Dracula meet their untimely ends, the Minion clan grows discouraged and exiles itself to Antarctica. After many years pass, one of the Minions named Kevin recruits other Minions Stuart and Bob to begin their search anew in 1960s New York. For those unfamiliar, Minions do not speak English but rather Minionese, a made-up mishmash of a language that consists of silly sounding words from various languages (cucaracha, papaya, etc.) This is the crux of the movie’s humor, which can be good fun starting out (I still chuckle at their inflexions of “banana”) but following characters that essentially speak gibberish does present a very basic problem: none of their dialogue can advance the story. Instead, we have to rely on human characters to relay plot points very bluntly so that everyone can get on the same page. This process creates an experience of being dragged through an already flimsy story that feels like bits and pieces left over from both of the Despicable Me movies. The directing comes off of purely arbitrary, as there’s never much of a good reason why anything is happening at any point in the movie. Jon Hamm and Sandra Bullock (both woefully miscast) try to bring some life to their villain characters but they clearly just don’t have enough material to work with here. I get it: this is a kid’s movie and perhaps I shouldn’t have such high expectations. The fact is, any film genre can be done well and animated movies do not have to dumb themselves down this much to still appeal to their target audience. I understand that this movie has a slightly different demographic from something like Inside Out but it’s not terribly far off and that movie managed to be more poignant, memorable and much funnier than Minions. It may be impossible to deter kids from this franchise cash grab but it may not be too late to warn their parents.